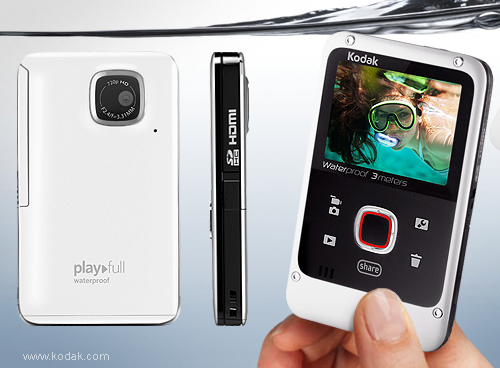 Kodak Playfull Waterproof video camera. The Kodak Playfull Waterproof is a pocketsize and 85 grams lightweight video camera, with 2-inch LCD screen, designed to take 720p HD video in water immersions up to 3 meters for up to 2 hours. It features a special mode for white balance, which helps to capture more true-to-life colours images underwater. The rugged case can resist mud, dust, and sand conditions and can even take a fall from 1.5 meter without sustaining damage. The integrated social media sharing button and pop-out USB arm make it simple to e-mail videos or upload to facebook, youtube and more. Workers have the luxury of knowing where the video cameras are placed, so they can move to the places where cameras don't exist to grab. Even though more innovative cameras are being used, employees have composed 47% of retail store robbery for the last several years.